Fun colors, inexpensive promotional product for $.99 each. 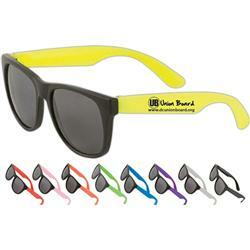 Sunglasses in a variety of colors, great for company picnics, beach parties and theme events. Call 888-332-ADCO for more ideas! Typical Imprint Area(s): LEFT ARM - 1.75" X 0.25". Available Imprint Options: 2nd location running charge $0.45 per unit.